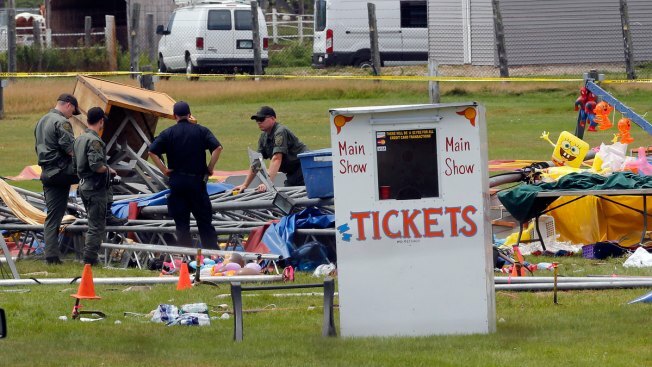 A Florida-based circus operator is contesting more than $33,000 in fines proposed by federal safety officials for a tent collapse that killed two people and injured dozens in New Hampshire last year. A spokesman for the Occupational Safety and Health Administration says the meeting between representatives of the agency and Walker International Events took place Wednesday. An agreement was not reached and Walker is going to contest the Feb. 4 citations. Robert Young and his 6-year-old daughter, Annabelle, of Concord, Vermont, died Aug. 3 when a storm with winds up to 75 mph blew through the Lancaster Fairgrounds, toppling the tent just minutes after about 100 people had settled in to watch a show.